Have you ever been to the supermarket and found yourself paralysed by which one of four different types of tomatoes to throw in the basket? It can be astounding how many questions rush through your mind like, ‘Do I need diced, crushed or chopped?’, or, ‘Do I get the larger tin that’s better value or the smaller tin which looks like a higher quality brand?’. It seems like there are so many options for as simple a task as just doing the shopping. So, what happens when you get to the important decisions like making an ERP software comparison between options that will run your entire business? Choosing an ERP isn’t a task to be taken lightly. It can mean the difference between dramatically improved business performance and profitability when getting it right, or getting stuck with more convoluted processes and decreased performance if it goes wrong. There are many different vendors, resellers and implementers out there, all pushing their own strengths. Which ones should you be paying attention to? Which are the top ERP systems to start researching? And how do you focus on your specific ERP solution needs to choose the ERP system that’s right for your business? 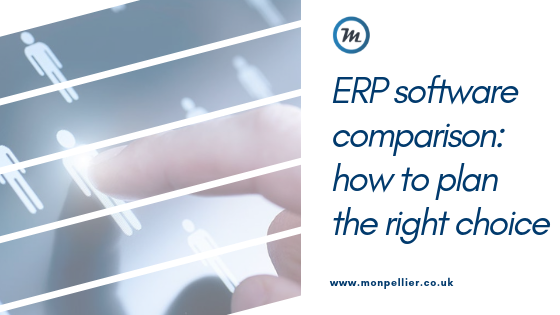 We’ve set out some straightforward considerations and steps to follow for choosing ERP software, and some questions you may not have thought about, that are sure to give you some food for thought. 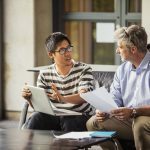 Before starting your research for ERP solution advice and comparing vendors and providers, it’s a good idea to jot down the biggest problems or pain points you’re trying to solve. What kind of process inefficiencies is your business seeing right now? Are you using multiple systems which don’t talk to each other? Think about all the processes that are happening in your business each day – including inventory and order management, purchasing, CRM, sales and marketing, and accounting. Consider running your shortlist past others in the business to help validate the importance of issues and uncover more opportunities for improvement. The most pertinent issues will soon reveal themselves and you can begin putting an order of importance to your list. The first choice: traditional on-premise or modern cloud-based? This is an important decision to make early on, as it will dramatically cut down the number of ERP options you need to compare and help crystallise what you’d like to gain from an ERP system. To touch on it briefly, choosing a cloud ERP simply means you’ll have an ongoing subscription to the vendor’s software. There’s no server equipment to set up as your system is accessed via a secure web interface. There’s a lot of flexibility with cloud-based solutions as users can access the system securely from wherever they are. There’s no longer a need to be in the office to stay productive. You’ll also be able to add functionality as soon as you need it, and all software updates are managed for you automatically by the software vendor. On-premise ERP solutions are the traditional set-ups which require servers and other equipment to be installed locally to run your ERP application. This is a non-issue if you already have a high level of existing IT infrastructure and skilled IT staff in-house to maintain and update equipment but can present a challenge for start-ups and small businesses due to larger up-front costs. Security and data redundancy are aspects which also need to be carefully considered. Keeping equipment on your premises presents a certain level of risk which needs to be mitigated. Whether it’s the risk of physical intrusion or natural disaster, it’s important to plan for a variety of circumstances that will ensure business continuity and safety of your important business data. No matter how competitive a quote for an ERP implementation may seem, an implementation project that’s not executed efficiently can drag on interminably. There’s also a commitment from your business’ stakeholders during this phase, dedicating their own time and effort to the project. If they’re kept working through the setup for too long, it’s likely to cause implementation fatigue and slow down the process even more. Find out if the implementation partner you’re looking to work with has a rapid implementation methodology. This is a positive sign that they’re experienced, organised and will keep the momentum going to see you going live and using the system sooner. Involving the key stakeholders from your business right from the start of implementation can be hugely beneficial. When they’re guided through the setup for their roles and responsibilities, they’ll become more confident in using the ERP once it’s in place. This reduces the need for additional training or extended time working system processes and usage after go-live. They’ll naturally become the champions and help to drive enthusiasm throughout the business in using your new ERP system. They’ll also be able to help other users get familiar from the beginning, quickly raising the collective knowledge and expertise. This is largely restricted to on-premise ERP solutions, as cloud systems are designed to work on virtually any device with minimal specifications. The physical equipment requirements for on-premise systems often requires a much larger, up-front investment. It includes hardware such as servers, operating system software for those servers, backup devices, additional networking and other equipment needed to run your business software. Many startups and small businesses don’t have this level of existing IT infrastructure, so be sure to find out about equipment requirements needed to run the ERP software you’re considering. It’s an additional cost that needs to be taken into account. Once you’re ready to start engaging ERP providers, find out whether they can manage everything for you directly from supply of the software, right through to implementation and ongoing support. Some solution providers manage all implementation work in-house, which provides a greater level of direct quality control. Others may supply the licensing but use outsourced partners to manage the setup and implementation. You may even choose to use a specific implementation partner yourself if you’ve heard positive feedback about that partner. The delivery of implementation plays a huge part to your ERP system’s success or failure. Regardless of whether it’s an ERP provider or a partner managing the implementation for you, find out how many resources they have, whether they’re locally based, and how many implementations they’ve completed to date. It’s important to have confidence in having experienced, knowledgeable resources setting up the software that will run your business. It’s the same situation for ongoing support requirements. No matter how involved your stakeholders and staff are throughout the implementation, sooner or later they’ll need help with using parts of the system, new features and enhancements, or alternative processes that they haven’t seen before. Over time, businesses also see staff changes, which means having re-training needs. Does the ERP provider you’re considering have the resources to provide local support and training? To wrap up the research process, and to give yourself reassurance that you’re choosing the right ERP solution, get across the success stories of other clients who have chosen the same solution. Have they made significant improvements to their business by using the software? Have they managed to reduce costs, grow their business and improve performance? If you can’t easily find customer success stories on an ERP provider’s website, ask them to provide case studies, success stories or other material that provides proof of their solution for your type of business. If you’ve got more to do than time to do it, then we need to talk. An ERP system is something that can not only help improve your business processes and make your business become much more efficient, it will also free up time so you and your staff can focus on other things in the business. Get in contact with us today to see how we can help, by either dropping us a message here, or calling us on 0191 500 8150 to speak to a Business Software Consultant.